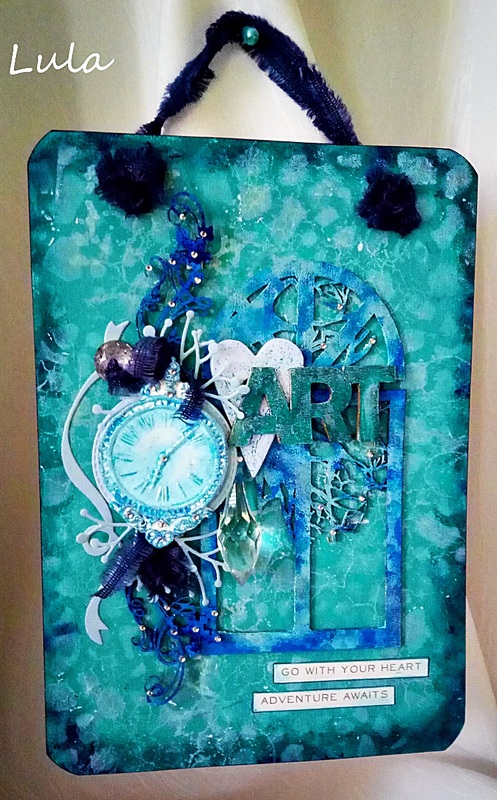 It is time to introduce our Guest Designer for the Winter Blues challenge. Please say hello to Lucyna (a.k.a. Lula) Marynowska who was the Top Pick from the In The Kitchen challenge. Lula can be found on her blog At Lula's. Hi Everyone! My name is Lucyna Marynowska aka Lula. Let me tell you all at Frilly and Funky I am absolutely delighted and honoured to be a guest designer here, this is such a talented design team! I come from the north of Poland. 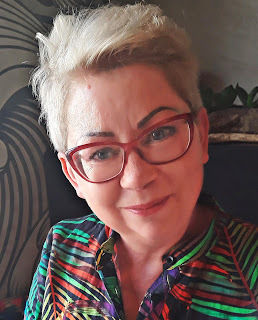 Sixty, retired widow, mum of two grown up boys and a happy grandma. I started my crafting journey 7 years ago as a card maker and immediately became an addicted paper-lover. After my husband's death it was crafting what helped me to conquer the pain. I enjoy creating anything from cards to altered art and love to experiment with various types of mediums. I am keen on colour and texture and I always try to find new ways to express myself. I love challenges to spark my creativity and making crafty friends all over the world makes me very happy. For the current theme "Winter Blues" I have prepared a wall hanger. I was inspired by the look of my bedroom window in frosty winter time. 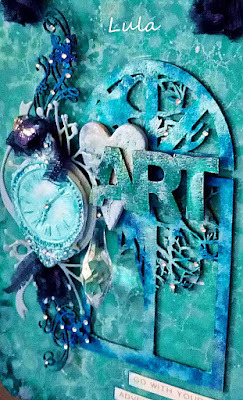 I have used lots of mixed media stuff to make this piece and emphasized its texture. Starting from various shades of blue paints, inks and mists, through shiny waxes to sparkling gems. With a little help of chipboards, die cut and resin pieces I was able to recreate the moody, cold winter scene. You can follow the steps I am sharing on my blog. Hope you like my project! As Lula mentioned, she has all the details about her fabulous wall hanging on her blog, so pop on over there to take a look and while you are there don't forget to browse around to see all her other fantastic projects. When you have finished come on back and share your Winter Blues creation with us. The challenge can be found HERE and runs through 11:55 pm EST on February 12th. One of your designers will be here on Saturday with another Saturday Showcase and then next Wednesday the gals on the funkie side of the Design Team will be here with more Winter Blues inspiration for you so please check in often with us because there is lots happening here. So many beautiful shades of blue and a lovely composition! Lula, it was wonderful to learn a bit more about you and have you as our special Guest Designer! Thank you so much for all your hard work! Gorgeous wall hanging, I love all the layered elements! Beautiful! Wonderful shades of blue with cool layers! Thanks for Guest Designing with us! Gorgeous wall hanging, I love all your blue layers. Thanks for being a guest designer! Oh Lula this hanging is absolutely gorgeous! You really have captured that look of a deeply frosty morning. I love the different elements you've chosen to surround the window. Thank you for joining us as a Guest Designer and sharing such a beautiful project. I love your take on the theme winter blue Lula, a fabulous Guest Design piece. There is so much inspiration which surrounds us. I'm so glad you shared this with us all.